I do a lot of school visits, which are always great fun, and I love hearing children’s fabulous ideas for stories and characters. But usually I only get to work with a class for an hour or so, and although that’s enough time to get some good beginnings for stories, I rarely get to see the final polished product. 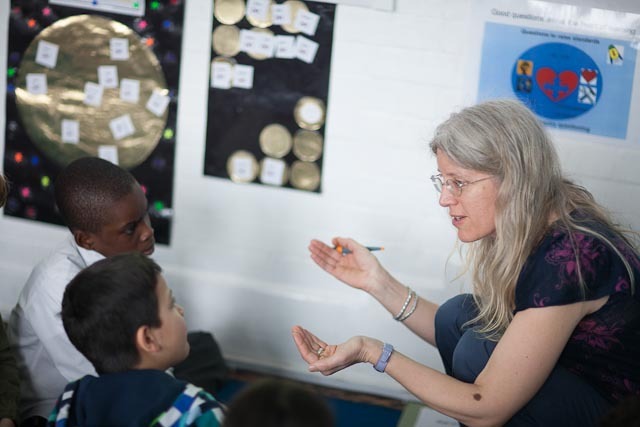 Recently though, I did something quite new – I worked with the same group of children for a whole morning a week over five weeks. The reason we were working together over such a long time, is that we were writing a book. Yes – that’s right. A whole book! We started by doing lots of warm-up exercises to get to know each other, and lots of fun short writing exercises, and then we rolled up our sleeves and started to brainstorm the plot, characters and setting for the book. Gradually, the whole story outline got decided, and then different small groups took on the task of writing different chapters. We listened to each others chapters, discussed how the whole story was shaping up, gave each other suggestions, and finally – a book was written! The next task was to get it published. And this is easier than you might think. Various companies offer self-publishing where you can either make an e-book or what’s called a ‘print on demand’ book. This means if someone wants your book, they order it online, and the book is printed specially for them. I tried it out with Amazon, with a story of my own that hadn’t been published. I uploaded the book, sorted out the layout, made a cover, and – ta-dah!! You can now purchase The Boy Who Turned into an Alien on Amazon for £3.99 for the paperback or £1.99 on kindle!! Having done it once to check it worked, I am now busy sorting out the publication of the story we wrote at school. It’s called Level Complete and it features a crazy school caretaker, a mysterious and deadly computer game and two children, Jennifer-Mae and Joe, who have to battle through the computer levels to save Jennifer-Mae’s young brother, Alfie. It’s really exciting, and I can’t wait to show the finished product to the children who wrote it. They are now published authors – under their pen name, Joe King (geddit??) and that’s something they can be really proud of. Hopefully it will encourage them to carry on writing! Cecilia Busby writes for children as C.J. Busby. 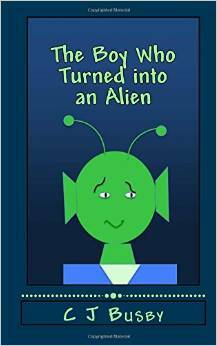 Her latest book is The Boy Who Turned Into an Alien. Tags: joint writing, school visits, self-publishing, Story-writing. Bookmark the permalink.